Following is the sixth in a series of articles in which leading architects discuss their representative work. ― Ed. Surplus is a product of a consumer society. Surplus exaggerates values, and, in turn, produces an infinite bubble of surplus. Similarly, a modern city extends itself with capitalism-friendly logic, and gives it the same bubble logic. But the surplus of any place on earth means a lack in another place. The essential problem of such surplus originates from a dishonest definition of the object that we must fill. That is the start of the plunderous characteristic of the modern city. Today, we overlook the collapse of the surplus. In the past, we only concentrated on how to fill our city. Now, a new paradigm of emptying while filling is needed ― the logic of addition and subtraction. The strategy of addition and subtraction removes a surplus society, and creates esthetics of ambiguousness. The ambiguousness that overcomes the dichotomous status will create a new ontology. Finally, this will evolve into a paradigm for new coexistence. The main point of the strategy of addition and subtraction means a new perspective in understanding of space ― more than merely interpreting space with filling and emptying. It not only overturns the space order and system that were interpreted previously, but also establishes a new definition of spatial sense. The space forms a different cast of reason within the reinterpreted order, while being replaced with a new semantic being. Herma Parking Building is designed with a new concept about parking. Even though parking lots are situated at important focal points of the city, parking projects in Korea are generally considered minor projects in the urban context. The goal of this project was to increase the value of land and the building on a low budget by breaking the stereotype of the typical car park. That is, the innovative design of the faade deceives people, as if the parking building were a museum or a car exhibition hall. People recognize this building as an ancillary parking lot within a commercial area, not the other way around. 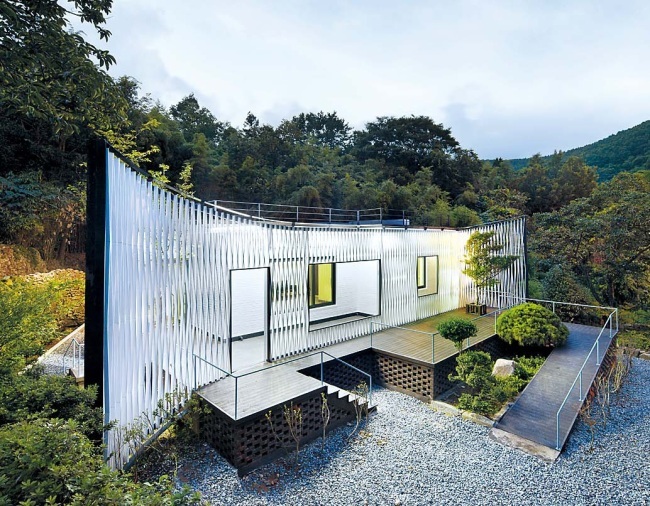 This project breaks the stereotype of rural houses commonly found around Namhae, Jindo, and Pyeongchang that have set the scenery of 20th century’s Korean farm village. Newly drawn “cheoma ,”or eaves, capture the earth and the point where the sky and the land merge. The faade that is created by the cheoma curvature is filled with parametrically-patterned aluminum louvers. Two perpendicularly-arranged diamonds form a single shape to flow through a curved line to compose the main faade. Lee Jeong-hoon studied architecture and philosophy in Seoul. In France, he received degrees in architectural materials and architectural theory. Lee worked at Shigeru Ban Architects in Paris and the Zaha Hadid Architects in London. 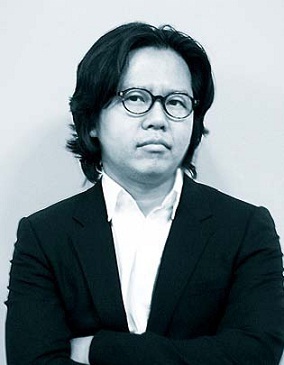 He founded JOHO Architecture in Seoul in 2009. He has won several international competitions and was awarded the 2010 Young Architect Award given by the Culture Ministry.